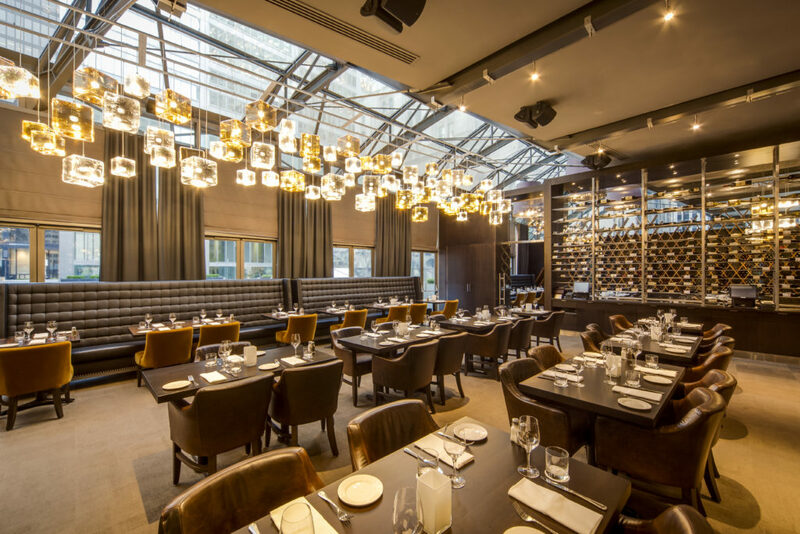 Oliver & Bonacini Hospitality is one of Canada’s leading fine dining restaurant and event companies, with a portfolio of site-specific, iconic restaurants and venues. Using their surroundings and context as inspiration, the team captured the client’s ambitions on several of their flagship sites. Bannock: Bannock was developed for Oliver & Bonacini Restaurants as part of the improved Food & Beverage program offered at The Hudson Bay department store. 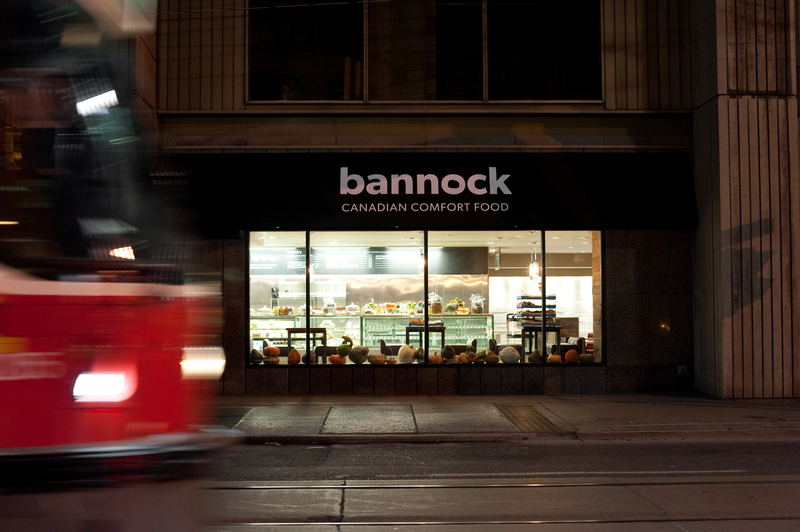 With Turner Fleischer providing Interior Design services, Bannock was conceived with a theme of providing “Canadian comfort food” so the interior aesthetic lent itself to materials that were native to Canada, presented in a modern forum. Notable features include the use of reclaimed hemlock wood, which was salvaged from one of the Queen’s wharfs in Lake Ontario, at the bottom of York St. A white washed pine and concrete imprinted with wooden planks help to round out the space. Jump: Jump has always been big, bold and confident, a reflection of its location in the heart of the Financial District of downtown Toronto. The Turner Fleischer design maintained this classic Jump bravado but added warmth, intimacy and refinement. The Interior Design team explored a variety of textures from the burnished leather chairs, mohair amber accents to the charcoal wool drapery. The central feature to the dining room is the custom 46’ light feature in amber and silver toned ‘ice cubes’. 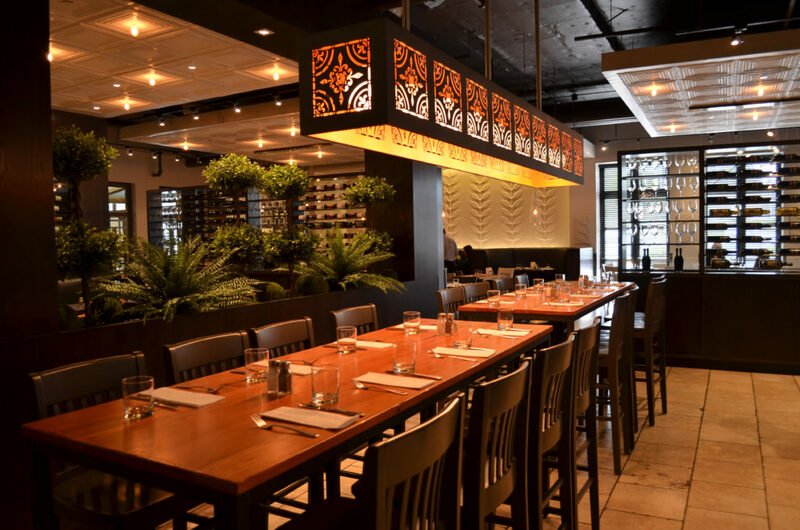 Café Grill: Bayview Village is one of four O&B café grills, so the design needed to reinforce the strong brand image of a classic open kitchen bistro with an urban feel. Charcoal greys, crisp white and graphic black all combine in creating this overall ambience. An accent of tangerine orange, on the school house chairs, adds whimsical feel to the space. Dramatic and distinct light fixtures hang from both exposed and hand rubbed tin ceilings. The wine displays act as dividers in an otherwise open dining room. Large, whitewashed plaster artwork graphically representing fresh ingredients expands across circular built-in booths. A private dining room at the back showcases a wallcovering that mimics the embossed tin ceiling pattern in a strong modern way.